Gershon Koffie is a Ghanaian footballer who plays for New England Revolution in the U.S. Major League Soccer on loan from Swedish club Hammarby IF. Koffie grew up in the Ghanaian capital Accra, and began his soccer career when he joined Rot-Weiss Accra – a development club affiliated with German club Rot-Weiss Essen – as a nine-year-old in 2000. He spent five years with Rot-Weiss Accra, before signing his first professional contract in 2006 with Ghanaian Division Two League team International Allies at the age of 15. Having been spotted by Vancouver’s Director of Soccer Operations Tom Soehn at a tournament in Ghana, Koffie relocated to Canada in 2010, and subsequently signed with the Vancouver Whitecaps of the USSF Division 2 Professional League. He made his Whitecaps debut on September 5, 2010, in a 0-0 tie with the Puerto Rico Islanders. On February 9, 2011, he signed a new contract for the 2011 Major League Soccer season with Vancouver Whitecaps FC. He scored his first goal for the club on August 7, 2011, in a 4-2 win over Chicago Fire. 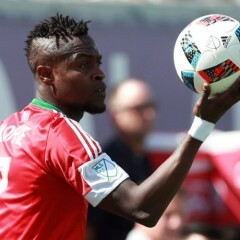 He would later establish himself as a key player for Whitecaps FC, making a total of 133 appearances, and scoring on 9 occasions.Before the 2016 MLS season Koffie was traded to New England Revolution. The deal was confirmed on February 11, 2016. Koffie would later move on to make 22 competitive league games for New England during the season. His stint at the club was plagued by injuries, but Koffie performed like a club MVP when healthy, covering acres of space in the middle of the park while constantly bullying attackers. On January 15, 2017, he moved to Europe for the first time in his career, signing a three year-deal with Hammarby IF in the Swedish Allsvenskan. He was loaned back to his former club New England Revolution in May 2017. Koffie was called up to the Ghana U-20 national team for the first time in July 2010. He was named in Ghana’s team for the 2011 African Youth Championship, starting against The Gambia on April 21, 2011. He was substituted after an hour for James Bissue. He made a substitute appearance against Cameroon on April 24, 2011, replacing Paul Aidoo in the 67th minute. Ghana were eliminated from the competition at the group stage finishing in third position behind Cameroon and Nigeria. In 2017, Koffie was handed his debut senior national team call up, he was invited for Ghana’s friendlies against Mexico and the USA, even though he did not feature in both games.